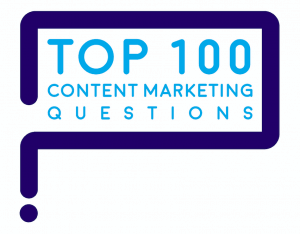 “How to keep content relevant?” is one of marketers’ top 100 questions about content marketing. Listen to understand buyers’ needs thoroughly. Guide buyers on a clear path through content to conversion. Keep content fresh and engaging. 1. Listen to understand buyers’ needs thoroughly. 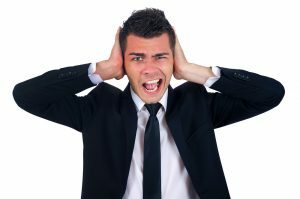 If buyers don’t feel heard, they won’t listen to your content. Make sure you hear their questions and pain points. Many marketers say they use buyer persona research. But more often than not, that research consists of demographics, segmentation, or stuff someone just made up. Sorry, that’s not real buyer persona research. To understand buyers’ needs takes buyer persona research. That is, talk with 10 or 12 buyers who’ve reached a decision in the past 6 months – whether to buy from you, buy from a competitor, or stick with the status quo. Buyer persona research employs one-on-one interviews to learn what buyers are doing backstage as a buying process unfolds. 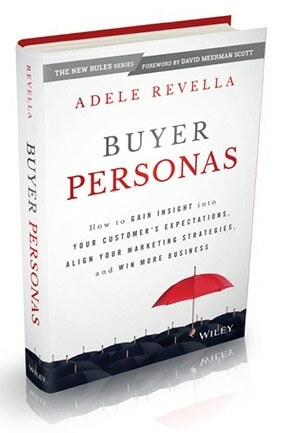 It’s the only type of market research that’s unscripted, notes Adele Revella, author of Buyer Personas. Adele Revella’s book Buyer Personas is a great guide for planning relevant content. How do buyers describe, think and feel about their problem or pain point? Which steps do buyers take and what jobs do they need to get done? Which information sources and people do buyers consult? Where do buyers get stuck, and how do they get unstuck? Which past events or present obstacles do buyers need to overcome? Which attributes of sellers’ offerings do buyers care about most? Who makes the final decision, who influences it, and who are the bystanders? Recognize a need to change or stick with the status quo. Evaluate their options to address the problem or need. 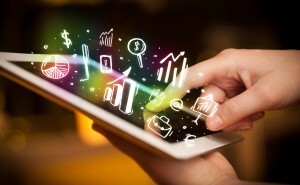 Resolve concerns about sellers through third-party opinions and social proof. Set the terms and conditions they can accept on a purchase. In a carefully considered purchase, buyers take these 4 steps, asking different questions and seeking different content at each step. 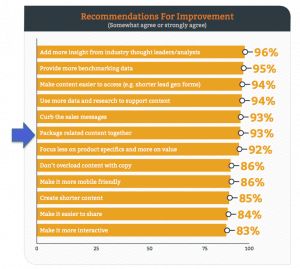 By missing one or more of these steps, brands lose buyers along the way. Here’s a case history about a brand that offers content for all 4 steps in the buyers’ journey. What are your buyers’ top 100 questions? Another way to learn buyers’ needs is to focus on their questions. Do the work to find out your customers’ top 100 questions. 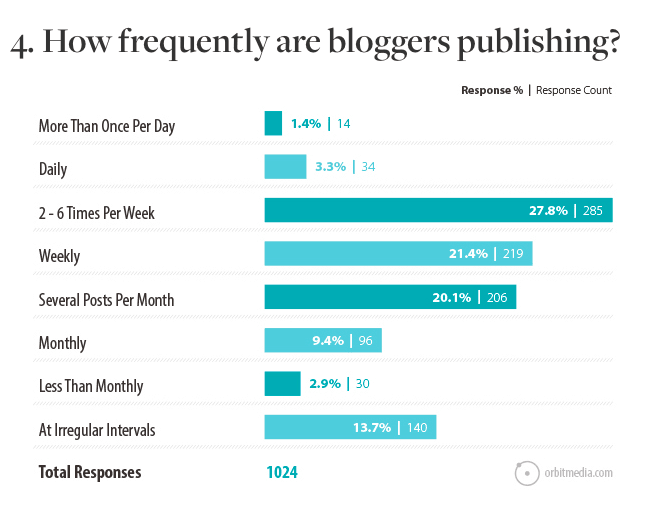 Then answer them with your content marketing. When you know what your customers’ top 100 questions are, you can create content that’s exactly what they’re looking for. It takes 3 steps to convert customers’ questions into relevant content: gather, analyze and answer. Sit next to customer service reps in a call center and write down buyer and user questions. Or give call center reps incentives to write down the questions word for word. Do a Google search and collect questions from the “People also ask” box. Do a YouTube search and start to ask a question (without completing it) so you can see customer questions. Use the BuzzSumo question analyzer, which aggregates questions from many websites, including Yahoo, Amazon and Quora. Ask sales or customer service to write down each question they hear from customers. Next, load the questions into a spreadsheet and tag each by topic. What topics is each of the questions really about? That’s what the tags should capture. 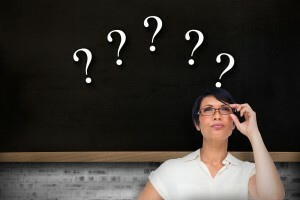 Which buyer questions are the most important ones? What do questions reveal about where the buyers are in the decision process? 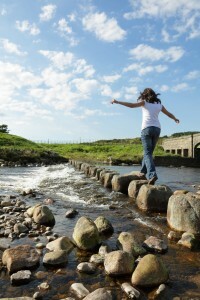 What pitfalls do buyers encounter? How do they overcome them? 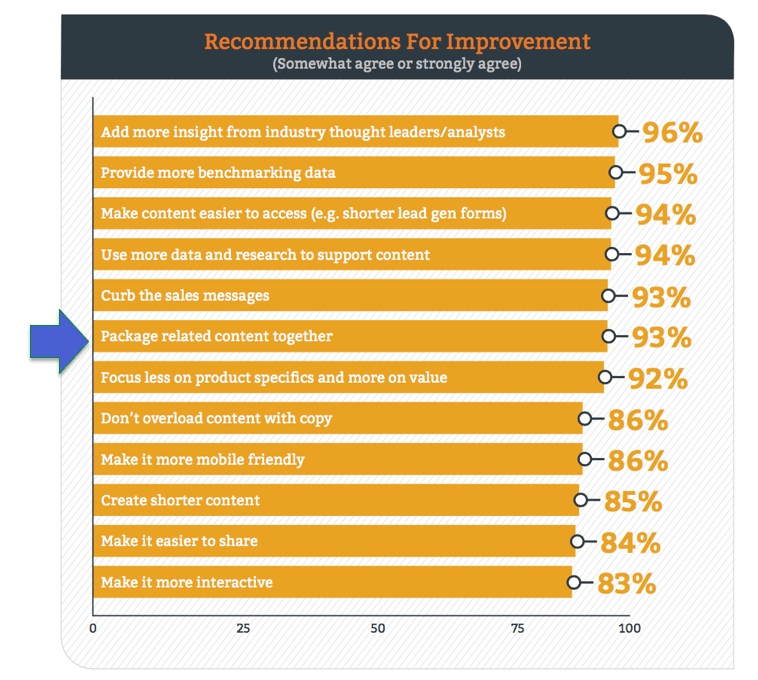 After the analysis, you’ll have the Top 100 questions identified so you can answer them with content. Create a separate webpage for each topic and include buyers’ questions verbatim. You can focus on each piece of content on only one question. Or bundle related questions together, as this blog does. 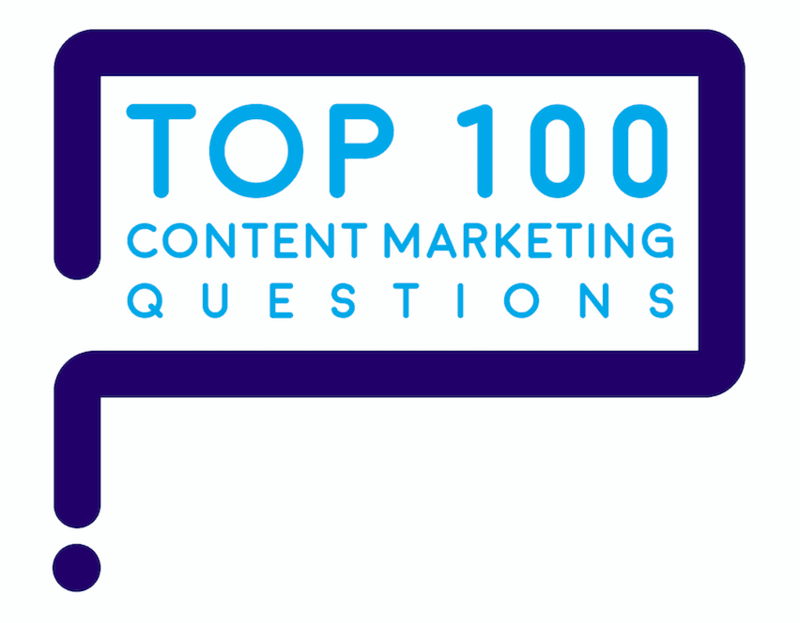 Here’s the process I used to identify marketers’ top 100 questions about content marketing. Which topics draw the most website traffic? What email topics get opened and clicked the most? Which social media posts generate the most engagement? Use your website, social media and email analytics to identify the topics that are most relevant to buyers. Many brands find out that 20 or fewer web pages generate half or more of their traffic. Are those top 20 pages about 20 different topics, or can the pages be clustered into a smaller set of key topics that people want to learn about? 2. Guide buyers’ path through your content. Too many websites turn content discovery into a treasure hunt. The things that are most valuable to buyers are here, there and everywhere — and they’re too hard to find. Buyers’ response to a treasure hunt? They go back to Google instead of staying on your website. Yikes! 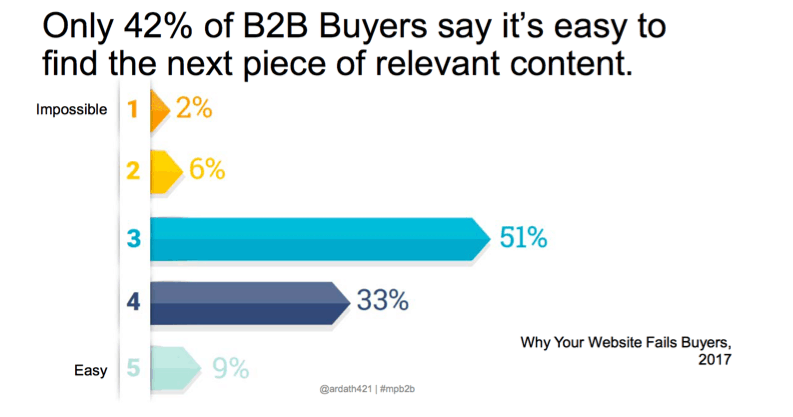 After B2B buyers consume a piece of content, more than half of them lose their way on their journey through content. A study called “Why Your Website Fails Buyers” shows that only 42% of B2B buyers say it’s easy to find the next relevant piece of content. 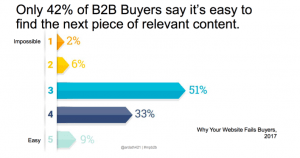 Less than half of the buyers can easily find the next piece of content they want. And 93% of buyers are asking for related content to be packaged together, says the DemandGen 2016 B2B Content Preferences Survey. 93% of buyers want related content packaged together on your website. Ask yourself: after buyers consume each piece of content, exactly what do you want them to do next? Offer a soft call to action: watch a video, read a blog, read an article, or take a quiz. Or a hard call to action: take a survey, download the white paper, sign up for a webinar, subscribe to the blog, or buy the product. The advantage of asking for a soft call to action first is this: if people have said yes to a small ask (soft conversion), they’re much likelier to say yes to a big ask (hard conversion). See more about how to apply the principle of commitment and behavioral consistency here. Why? Because people like to be consistent, observing the behavioral consistency principle. Content marketing needs to lead buyers along a clear path. When it comes to content, put like with like. Ardath Albee advises creating content hubs that lead buyers on a logical path from their problem to your solution. Here are her ideas to make your content not only relevant, but resonant and even binge-worthy. 3. Keep content relevant and fresh to stimulate ongoing engagement. 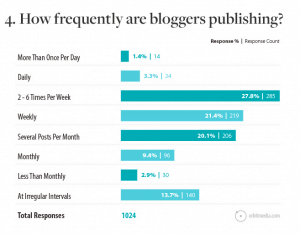 More than half of bloggers post at least weekly, Andy Crestodina found. When you publish weekly or more often, you gain opportunities to mention or highjack current news (knows as newsjacking), tap into current news trends, or create news of your own. Another idea to keep content fresh: don’t do a data dump. Don’t publish everything you have to teach about a topic all at once. Instead, publish one episode at a time, the way your favorite TV show does. That’ll keep people coming back for more. Welcome to Digital Photography School – a website with simple tips to help digital camera owners get the most out of their cameras. The problem with that content mission: after someone has read the camera reviews and tips, there’s no compelling reason to come back. It was a “one and done” experience. Digital Photography School has what you need to get your photography to the next level. From basic to advanced we offer daily tips, resources, and tutorials that will help you get the most out your camera. Other ways to keep content relevant and fresh? Offer surveys, games, quizzes and other content to arouse people’s curiosity. Answer questions in webinars. Transform those Qs&A into content. Encourage people to share content with easy share buttons. Along the way, such interactions with buyers create opportunities to seek soft or hard conversions. Listen hard and observe buyers’ behaviors. Guide people through the resources you offer. Bundle like with like. Post frequently to keep content fresh and newsy.